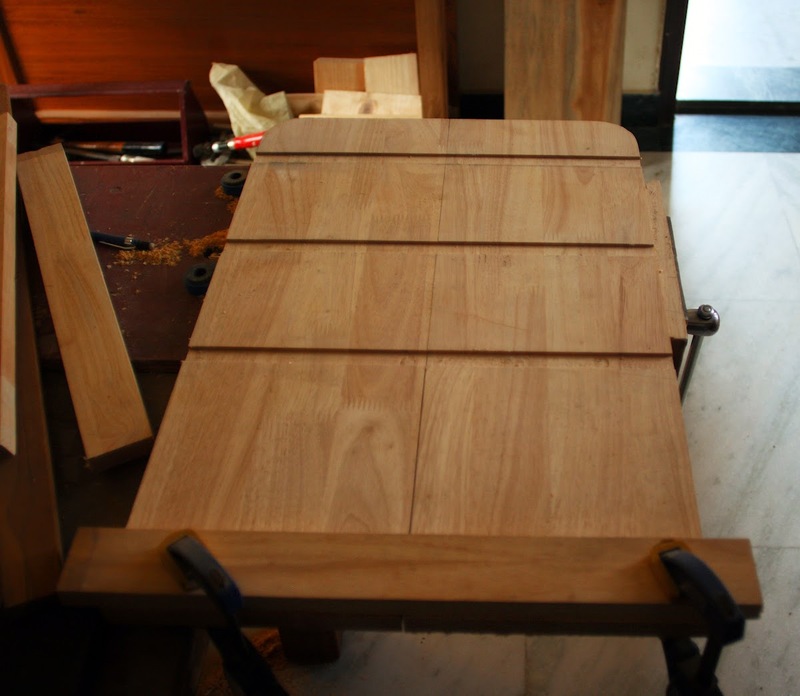 A lot of aspiring hobbyist woodworkers in India have to work with very tight budgets, extreme lack of space and no guidance. Not surprisingly most get put off when confronted with projects that require a lot of expensive tools or too much skill. For the beginner it is more important to make things out of wood rather than worry about joinery, high quality finishing and so on. It is very easy to make useful and very presentable items with just a basic set of tools, a few planks of plywood or rubber wood board, nails and glue. The choice of finish for the beginner would be plain old paint, the kind that is sold at every hardware store. After making a few pieces of basic items with nail and glue, one should go a step beyond and try some basic joinery, making housings, grooves and so on. While the end result might not look vastly different from the one made of nail and glue, it will be infinitely stronger and longer lasting. It would also mean ratcheting up skills. 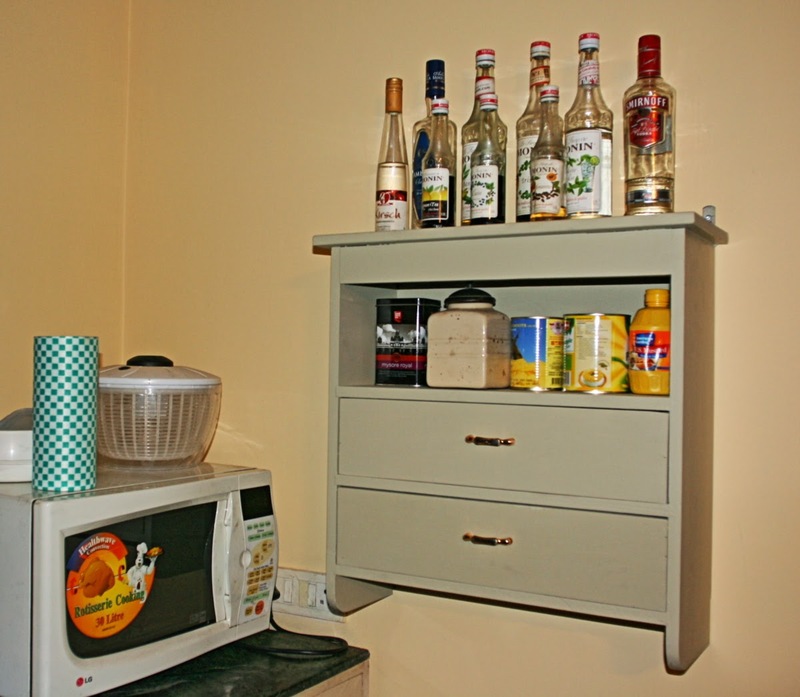 So here is a step-by-step presentation on making a kitchen wall shelf with drawers. Step 1: Each piece has been measured, marked and cut to final dimensions. Cutting each piece and accurately is perhaps the most basic and the most difficult part of any project. Even slight imperfections cause problems in assembly and joint making. Measuring, marking and cutting, I have learnt, is not to be taken lightly. It is easier and more accurate to cut housings with both pieces held together. This reduces if not eliminates all chance of misalignment. I usually cut housings with a router and a half inch mortising bit with a bearing on top. Glue is enough to hold the shelves together for this small project but I decided to add screws as well from the side to make the whole thing more secure. Plugging screw holes is not essential but is my preference. Alternatively, screw holes could be countersunk and later hidden with a filler. A strip across the front makes the whole frame extremely rigid and prevents racking. 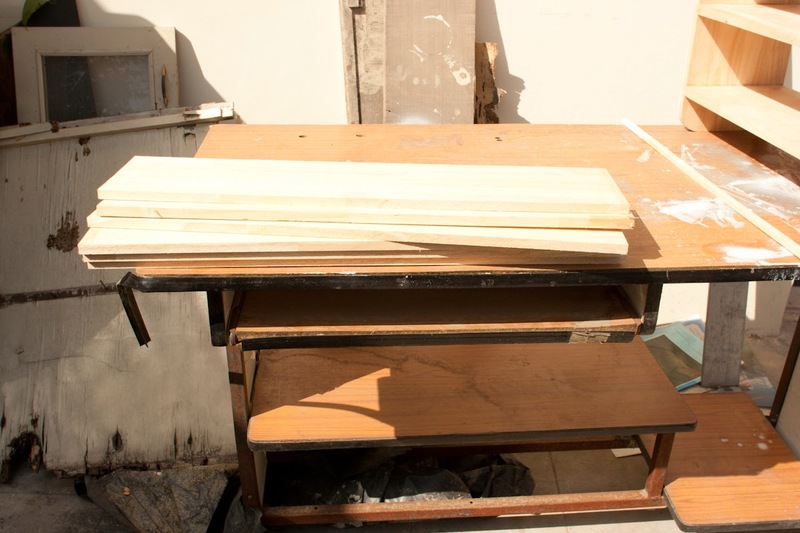 The strip can be attached by various means including dowels, nails and so on. I have used pocket-hole screws for convenience and strength. The edges of the top could be left crisp and sharp or treated. Different edge treatments result in varied looks. I have merely chamfered the edges with a hand plane but they could also be shaped by various router bits. The top could have been glued or nailed; I chose to screw them down and make a little slot for expansion. 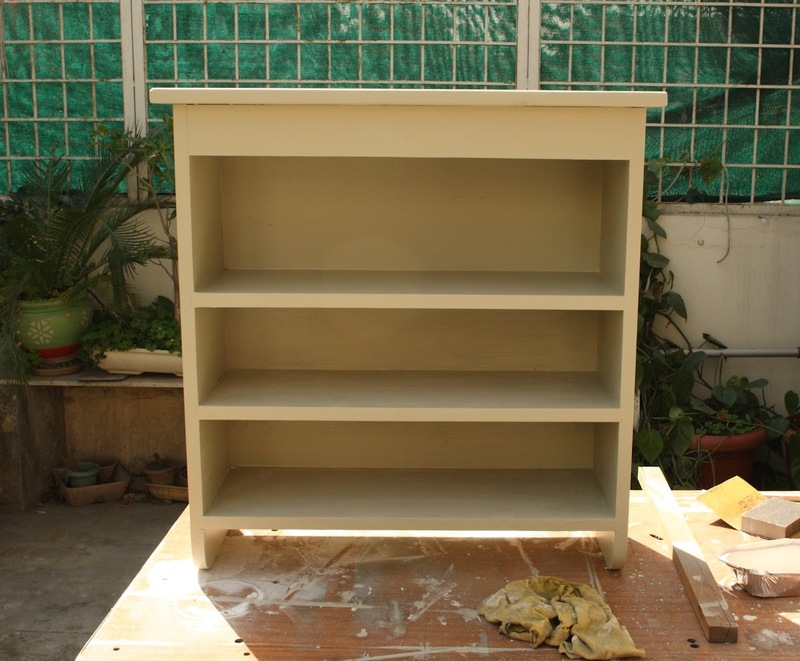 It is a good idea of paint the insides of the shelf and the inside top before attaching the back. This makes the paint job easier. 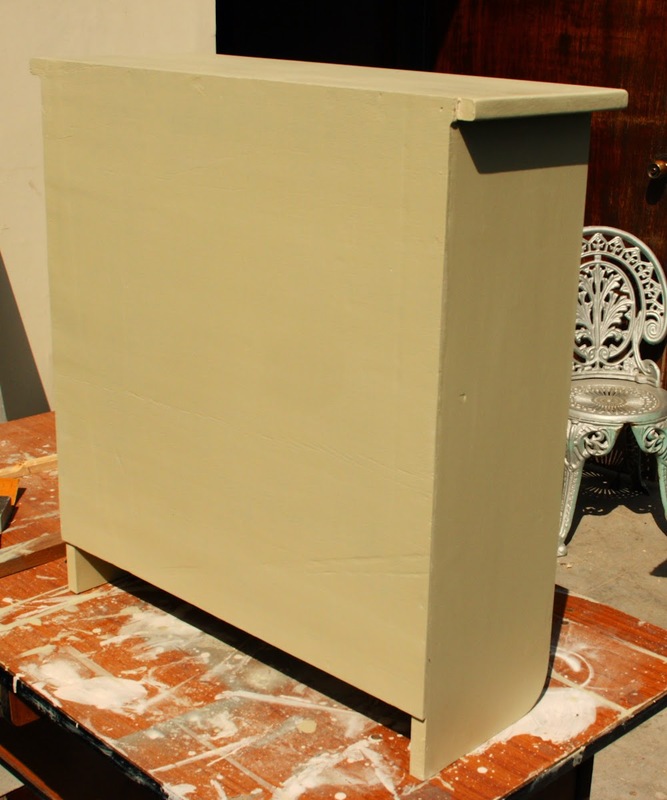 Make sure the edges of the sides on which the back is to be attached is not painted or else the glue will not adhere. 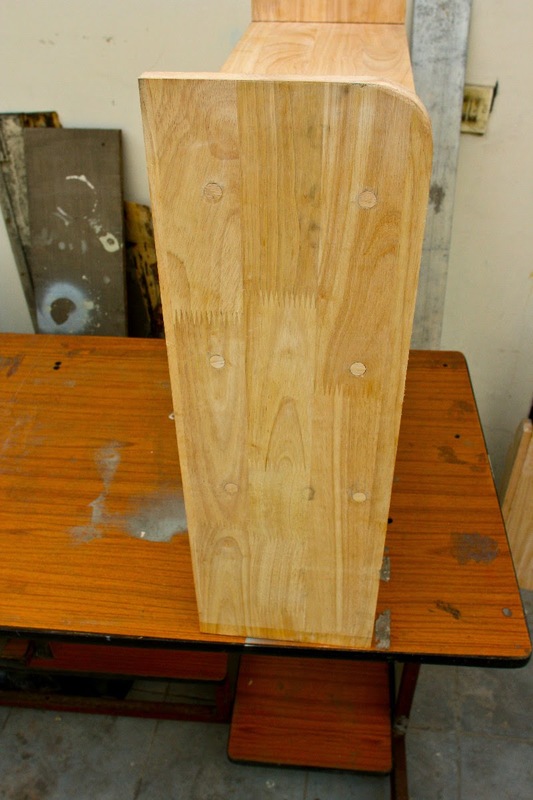 Here the 6mm plywood back has been attached by glue and half inch nails. This is good enough for the job as it will not take weight or be subject to great stress. It is better to apply the final coat of paint after the back has been attached. 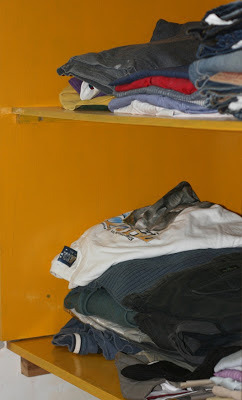 The shelves and difficult to reach places would already have been painted. 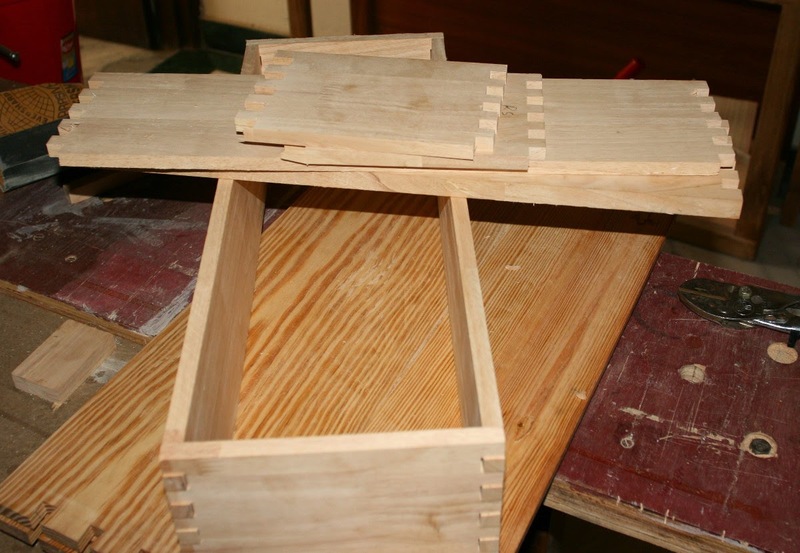 I used box joints for the drawers but there are many other ways of making drawers, the best being half blind dovetails (which I am yet to attempt). 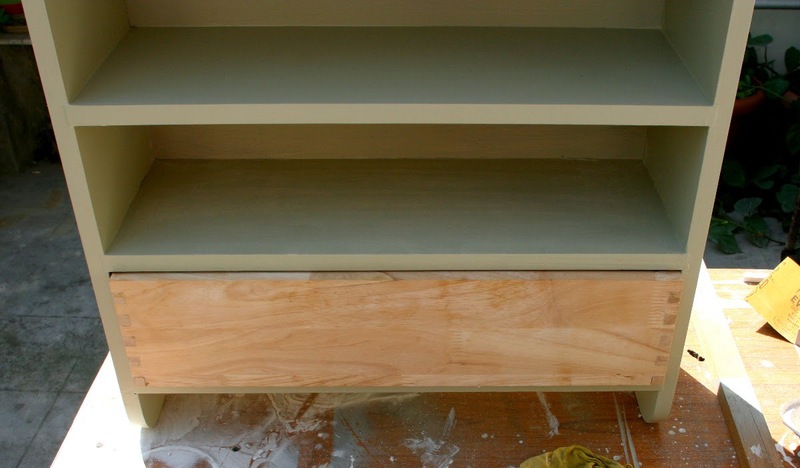 The worst kinds of drawers are those nailed and glued together; these invariably fail as drawers will be opened and closed hundreds of times and each pull will loosen a poor joint by a small amount. The cumulative effect over months will show sooner or later. The drawer sides should ideally be a snug fit, the adjustment being done with a hand plane. 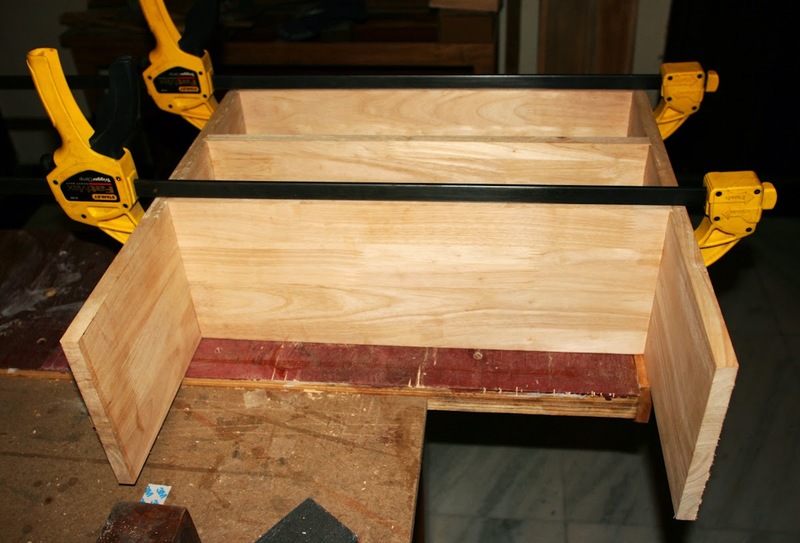 The drawers should be held securely in a vice before planing the edges. 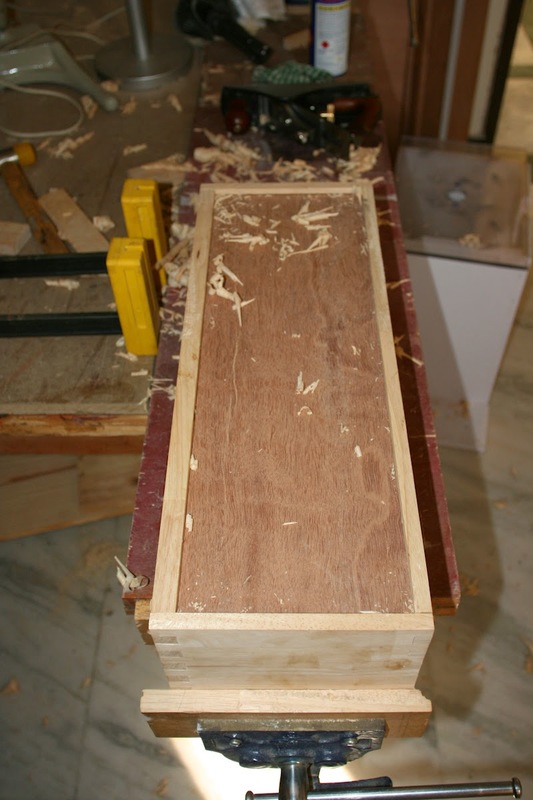 The drawer sides should ideally be a snug fit, the adjustment being done with a hand plane. 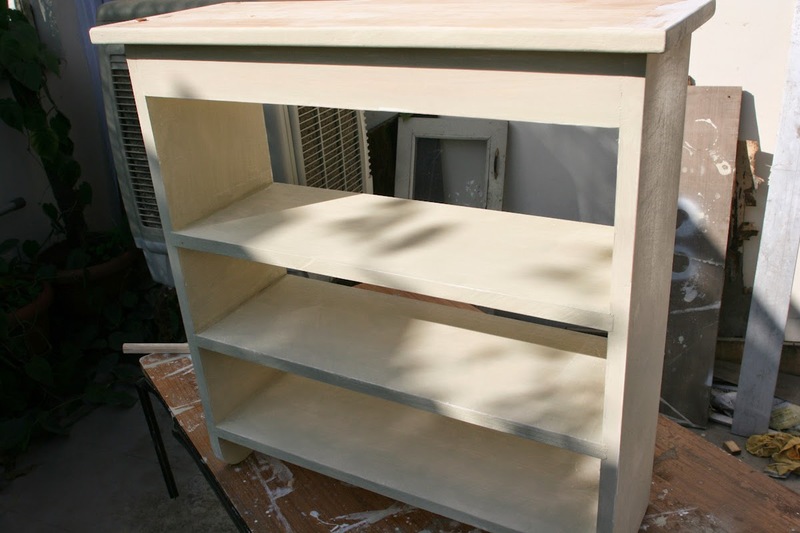 For a good even paint layer, follow these steps: sand the wood surface with 180 and then 240 grit sandpaper; apply two coats of wood primer sanding after each coat with 320 grit sandpaper; apply thin coat of paint as first layer, sand with 320 grit paper; apply two to three more coats with slightly diluted paint, rubbing with 320 grit sandpaper between each coat. A decent brush helps a lot and the degree of dilution of the paint is crucial. If the paint is diluted too much it will be watery and will not coat the wood evenly, and also often cause tiny bubbles to form on the surface which can be a problem. If the paint is too thick then the brush marks will be prominent. Just a wee bit of turpentine is required to properly thin paint but you will have to experiment a bit to get the consistency right. 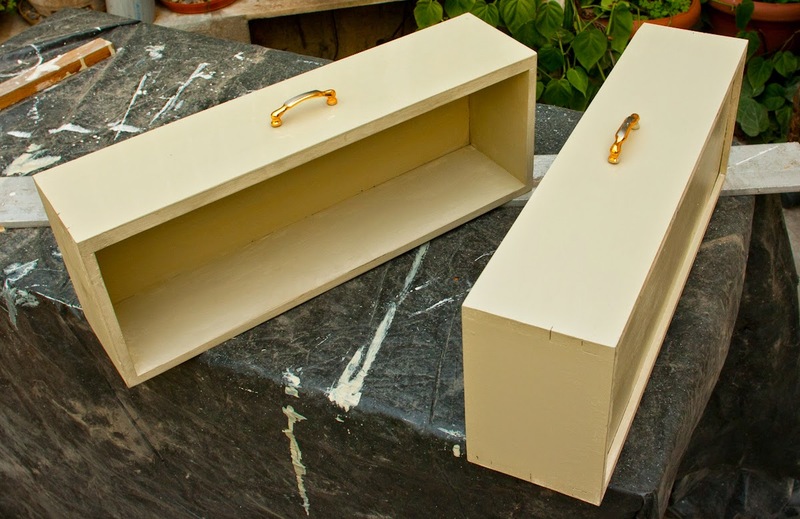 The undersides of the drawers have been waxed with a candle to facilitate easy opening and closing of the drawers. 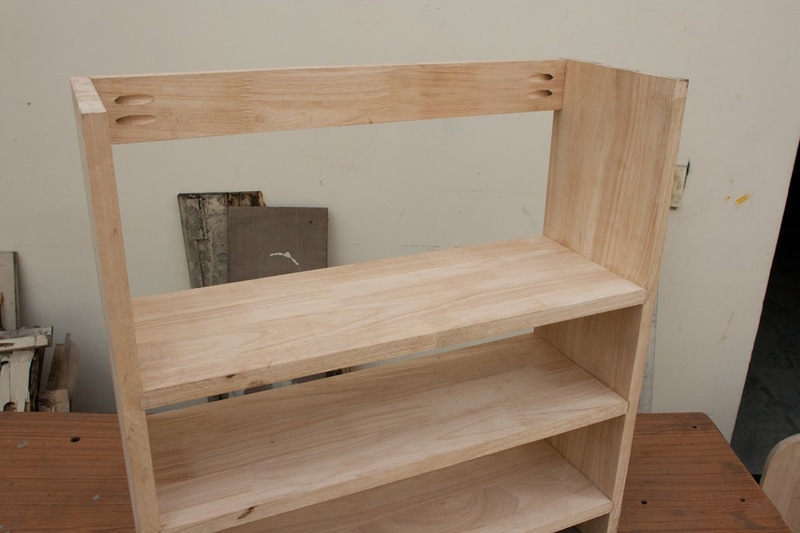 The shelf rests on a cleat (cannot be seen) securely screwed on to the wall and by brackets attached to the top back. This make the shelf very secure and capable of taking a lot of weight. Needless to mention, the extra storage in the kitchen has been much appreciated. Thanks Bala! Always appreciate a thumbs up from a pro like you. So what do you recommend a basic hobbyist in order to perfectly cut ply woods (a handsaw would work? )...this is one place where I'm getting a huge set back...n how did you make the curve on the side planks? The drawer joints- Are they dovetails? IS there any special drill bit which I can use to cut these joints? I've seen local carpenter doing something similar with his drill machine, and used the cut to hold beer mugs! Dipanjan: For cutting plywood cleanly a good handsaw such as the Stanley "20-221 - 10" Blade Length x 12 Points Per Inch SharpTooth™ Fine Finish Mini Utility Saw" will do. I bought this saw for about Rs 600 and it gives me a very clean accurate cut provided I first measure and mark the cut accurately with a pencil. Curves: First used a bottom of a glass to pencil the outline; then cut as much as I could with a hand saw; rounded it with rasp; lastly, sanded it down with 180 grit sandpaper. 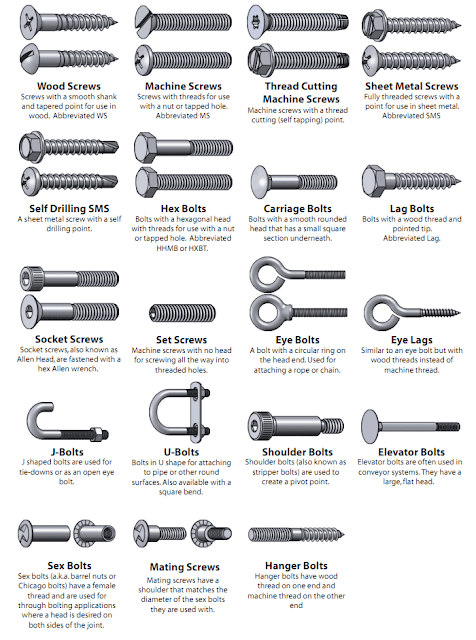 Drawer Joints: They are box joints. Could be cut by hand but difficult to get accurate. I used a router and a jig for this. I did not want to go ito that in this post. What was the jig you used to cut the box joints for the drawer? By Carol Reed". Its an excellent book full of ideras and designs which can easily be built by tyhe hobbyist woodworker. 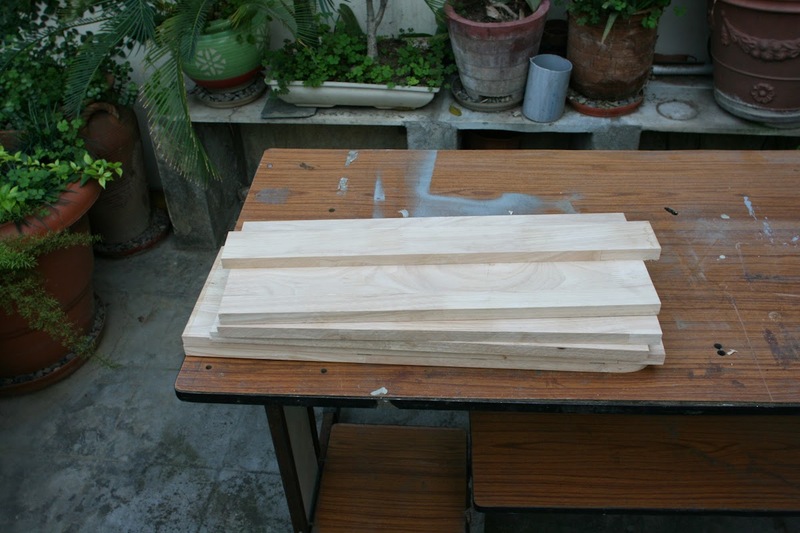 Get hold of it and first build the simple router table it recommends and then go on to build jigs. Best wishes. I have a small question. I'm just wondering if there is reason for using the screws for mounting the top layer rather than using pocket holes? 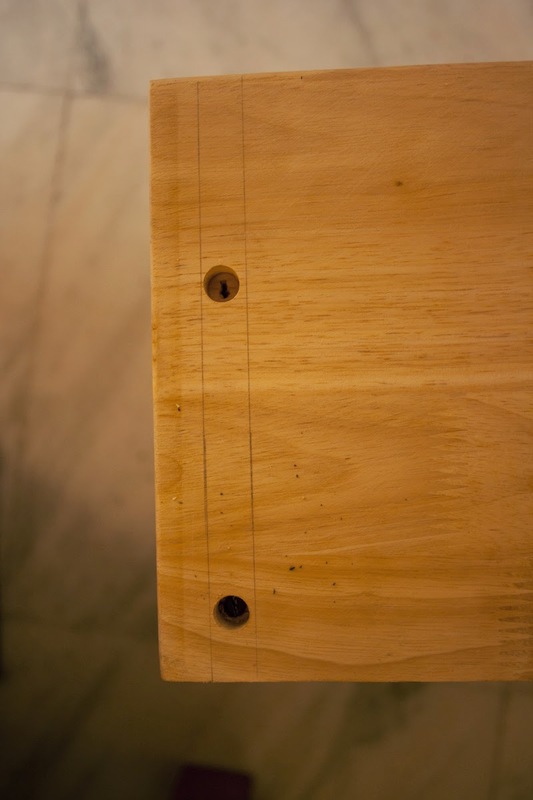 Because I see that you have used pocket holes for one of the joinery in this project. Pocket hole screws could have done as well; I probably inserted the screws from on top probably becuase it was difficult to get the drill inside for inserting pocket hole screws.